I have a few old web scraping macros which used Internet Explorer automation. I wanted to clean coding and speed them up with these requests. Unfortunately what I have noticed, MSXML2.ServerXMLHTTP and WinHttpRequest are slower on online store's 20 products test (34 and 35 sec) than IE automation with pictures and active scripting off (24 sec)! MSXML2.XMLHTTP executes in 18 secs. I used to see situations when some out of these 3 requests are 2-3 times faster / slower than the other ones, so I always test which one performs best, but never before had any request lost to IE automation. I would like to know if these 3 requests are all options I have to get data from websites without browser automation. Also - how possibly browser automation can beat some of these requests? I have tested the main result page with procedure provided in answer by Robin Mackenzie, clearing IE cache before running it. At least on this particular page, caching seemed to have no explicit gain, as subsequent requests yielded a similar result. IE had active scripting disabled and no images loading. Very surprising for me is the difference in amount of characters returned by these methods. There are some other Windows APIs that I am ignoring such as InternetOpen, InternetOpenUrl etc as potential performance will be outweighed by complexity of guess the response length, buffering the response, and so forth. So we should not use this method. I thought you need the php equivalent of file_get_contents and found this method. It is easily used (check this link) and out-performs the other methods when used on a large request (e.g. try it when you go for >2000 baseball bats). The XMLHTTP also method uses the URLMon library so I guess this way is just cutting out a bit of middle-man logic and obviously there's a downside because you have to do some file system handling. Debug.Print "URL download file method"
Debug.Print "Document length: " & Len(strResponse) & " chars"
Debug.Print "Processed in: " & Format(dteFinish - dteStart, "s") & " seconds"
With the URLDownloadToFileA it is taking me about 1-2 seconds to download you sample URL versus 4-5 seconds with the XMLHTTP method (full code below). This includes all methods discussed e.g. IE automation, WinHTTPRequest, XMLHTTP, ServerXMLHTTP, CreateDocumentFromURL and URLDownloadFile. strUrl = "http://www.justbats.com/products/bat type~baseball/?sortBy=TotalSales Descending&page=1&size=2400"
Debug.Print "Server XML HTTP method"
Debug.Print "HTML Document Create from URL method"
Most of the time is spent waiting for a response from the server. So if you want improve the execution time, then send the requests in parallel. I would also use the "Msxml2.ServerXMLHTTP.6.0" object/interface since it doesn't implement any caching. xhr.setRequestHeader "User-Agent", "Mozilla/5.0 (Windows NT 6.1; rv:25.0) Gecko/20100101 Firefox/25.0"
Not the answer you're looking for? 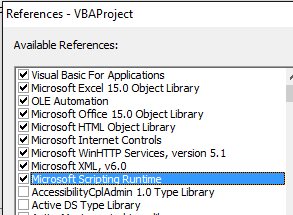 Browse other questions tagged vba excel-vba web-scraping xmlhttprequest excel or ask your own question. How to remove empty lines when iterating by values?